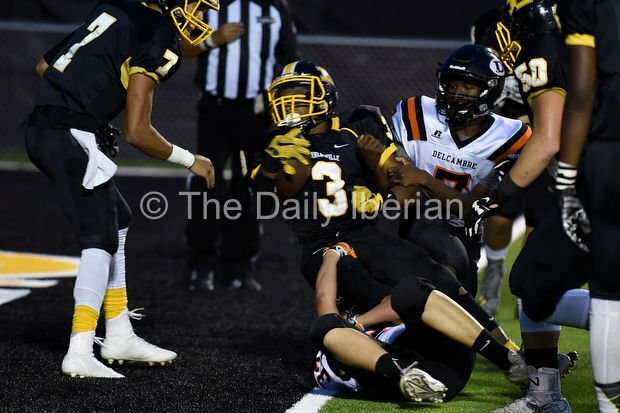 Loreauville’s Brennan Williams (3) fights over the goal line for a touchdown as Delcambre’s Hunter Delcambre, bottom, and Tylar Lewis, right, look to make the stop on Thursday at LHS. Loreauville won 44-13. Zack Frederick (42) of Delcambre carries against Loreauville on Thursday. LOREAUVILLE — Delcambre had the right idea. Head coach Marc Broussard came into Thursday’s District 5-2A opener at Loreauville with a plan to take the air out of the ball, have long sustained drives that ate up clock and put the ball in the end zone for a couple of touchdowns. It was a good idea, and Delcambre did everything right in executing it … except put the ball in the end zone for touchdowns. 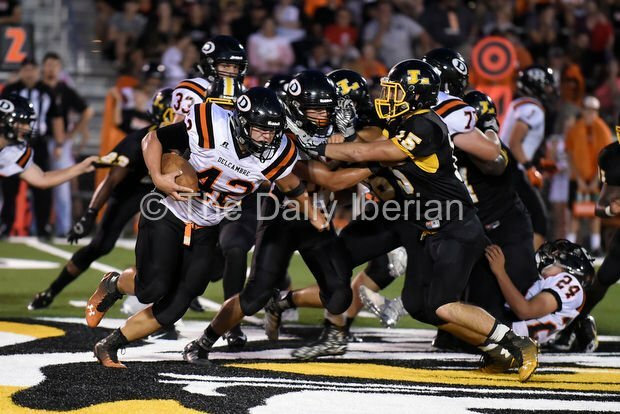 That part of the plan was executed by Loreauville quarterback Jared Henry, who threw three touchdowns passes, and running back Brennan Williams, who ran it in for two more and the Tigers came out of the district opener with a 38-13 win over the Panthers. At the end of the first quarter, Delcambre (0-4, 0-1) had run 25 offensive plays and had zero points, Loreauville ran four and had seven points. team improved to 4-0 overall, 1-0 in district. “Defensively they did some things that influenced us in the first quarter and we had to make some adjustments. The Tigers’ high-powered offense, on the other hand, showed that you don’t need a lot of plays to drive and score; only a handful is needed. Behind senior quarterback Jared Henry, who completed seven of nine passes for 111 yards and three touchdowns, and running back Brennan Williams, who added 126 yards rushing and two scores, Loreauville’s offense was on the field for all of 15 plays in the first half and scored four touchdowns. Williams scored Loreauville’s first two touchdowns on the night with runs from eight yards out in the first quarter and 14 yards out in the second quarter and had nearly 100 yards rushing by the end of the opening quarter. Up 7-0 at the end of the first quarter, the Tigers added three more scores in the second quarter as Henry threw touchdowns passes of 25 yards and nine yards to Bryson Broussard after Williams’ second touchdown run of the night and LHS went into halftime with a 30-0 lead. Henry’s final touchdown came in the third quarter when he connected with Ja’Den Jacobs on a 16-yard pass for a 38-0 lead. “We knew they were explosive and that’s why we had the game plan to keep them off the field,” said Broussard. “I’ve said this over and over again. You can’t simulate game-speed in practice. The Panthers rallied in the fourth quarter with a pair of late touchdown passes from Cole Delcambre to Oliver Nunez, one covering 76 yards and the other covering 53 yards. The other bright spot for Delcambre was the play of senior Zack Frederick, who rushed for 107 yards on 21 attempts and proved to be very tough for Loreauville’s defense to tackle. Delcambre travels to Catholic High next week, while Loreauville plays host to perennial playoff power Notre Dame.